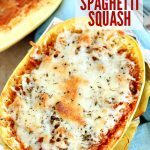 This easy Twice-Baked Spaghetti Squash recipe is a simple dinner idea that only needs 3-ingredients, is meatless, gluten-free, and frugal. I love spaghetti squash. I am so happy when fall and winter rolls around and I can buy it for super cheap. Usually .78 cents a pound or less. And I love how well it keeps. It’s not a vegetable that will go to go bad in a week. If kept in a cool place, they can keep for quite a while, I’ve even stored them for a long as a month. 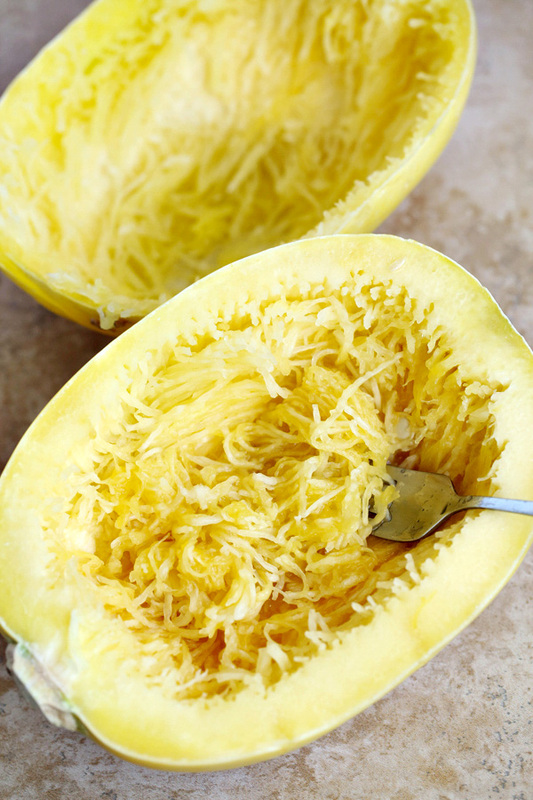 But, one of the best things about spaghetti squash: it’s fairly low in carbs. Much lower than its other winter squash buddies, like butternut squash. And definitely lower than pasta, which makes spaghetti squash a low carb substitute for pasta. My Bacon-Parmesan Spaghetti Squash is one of our most popular dishes (in our house and here on the blog). It’s almost always served as a side dish, along with a chicken dish or perhaps pork. 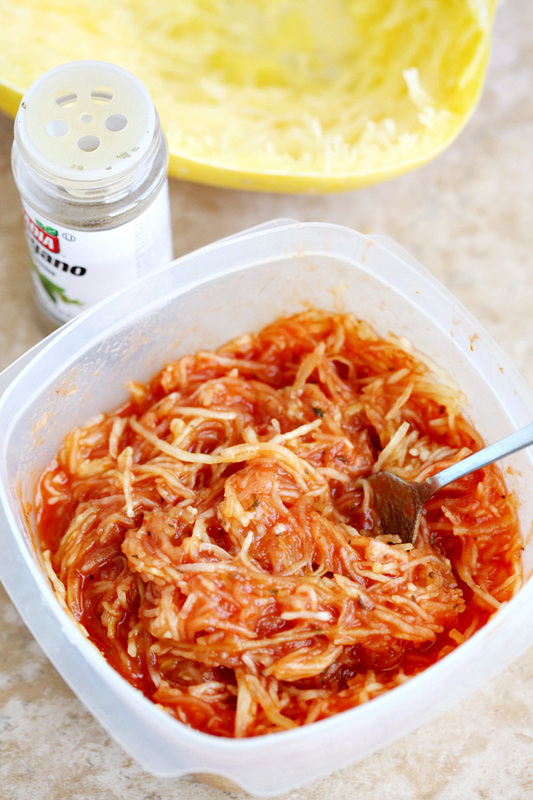 But there is lots of other ways to use spaghetti squash, including plenty of Easy Spaghetti Squash Recipes for Dinner. 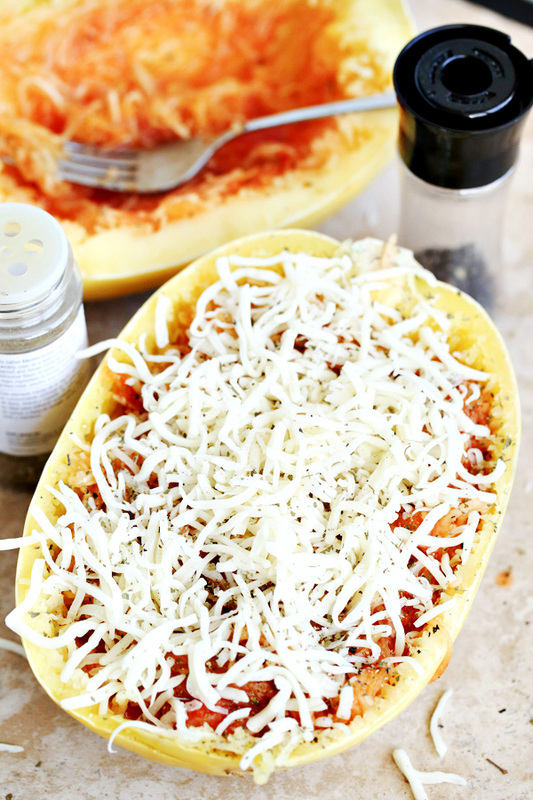 Today we’re sharing a very simple way to serve spaghetti squash for dinner: 3-Ingredient Twice-Baked Spaghetti Squash Recipe. To make this recipe, you’ll start by first cutting your spaghetti squash in half lengthwise. Scoop out all of the seeds and discard them. Place them on a baking sheet and bake to cook the spaghetti squash. While the spaghetti squash is still warm, but cooled enough to be handled, use a fork and scrape the spaghetti squash strands to loosen and separate them. Place the strands into a bowl and combine them with your favorite pasta sauce. If you wish, you can add additional seasonings, like salt, pepper, and oregano. 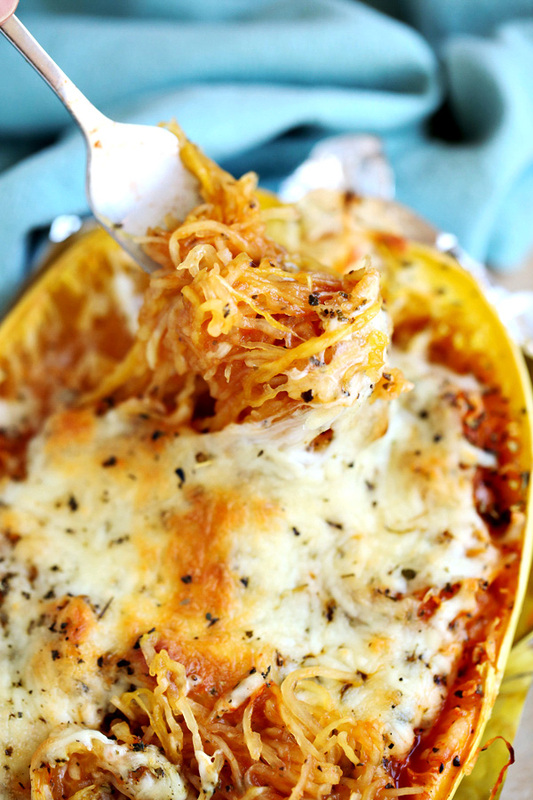 The spaghetti squash mixture is spooned back into the spaghetti squash “shell” and sprinkled with shredded mozzarella cheese. Bake until the cheese is melted, bubbly and starting to brown. We recommend serving right out of the shell. 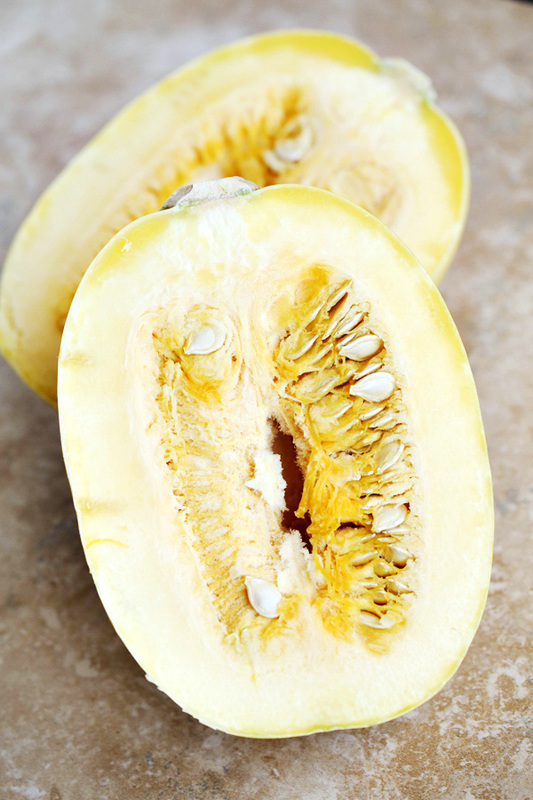 If you cooked smaller spaghetti squashes, you could plan 1/2 of a spaghetti squash for each person. Otherwise, a medium sized spaghetti squash will serve about 2 people. 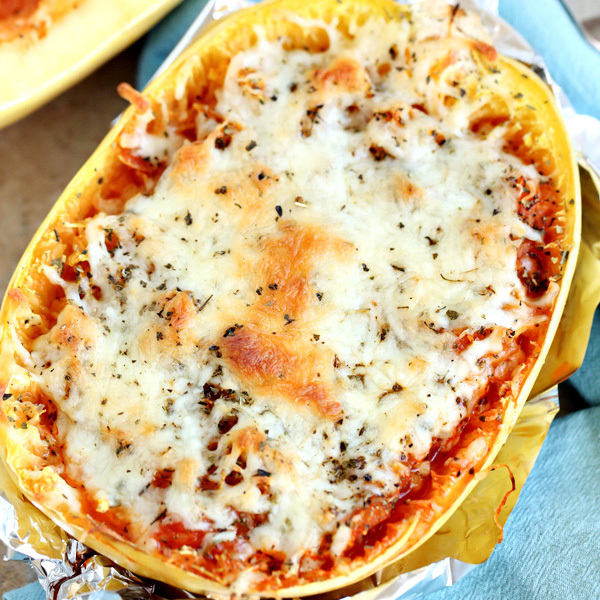 Here’s the full recipe for this Easy Twice-Baked Spaghetti Squash Recipe – ready for you to print. If you like this recipe, we’d love your support by sharing it on Facebook or pinning it on Pinterest. Place strands in a bowl. Mix strands with pasta sauce (and additional spices, if you wish). Adjust the amount of sauce you use based on your own preference. Spoon mixture back into the empty shell. If you have enough strands, you may be able to separate the mixture into each of the two shells, but you may also be able to spoon the entire mixture into just one of the shell halves. Sprinkle with mozzarella cheese. Bake for 7-9 minutes or until cheese is melted, bubbly, and slightly browned. Spoon and serve directly from shell. –Want to add meat to this dinner idea? You can add leftover or rotisserie chicken or cooked sausage when you add the pasta sauce. Spotted this recipe on the What’s for Dinner Sunday link up Party and had to come check it out. This looks delicious – definitely have to give it a try! This was delish! And easy to make. Deeelicious! I like to add sautéed mushrooms and onions to the mix. I put half the mixture in the shell, add cheese then repeat. I like spaghetti squash even better than pasta. I love that this requires three ingredients only! 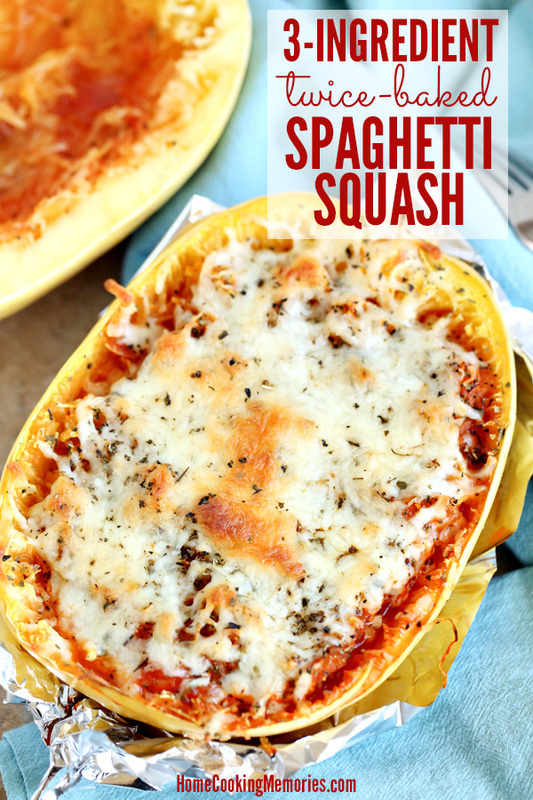 I have to try spaghetti squash as this looks absolutely delicious! Thanks for sharing! Thank you for sharing this recipe! I made it last night and it was a hit – even with my picky husband! Only the second time I’ve made spaghetti squash and this recipe will be in my regular rotation from now on! Cute idea to twice-bake the cooked squash in the shell. 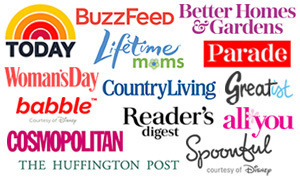 I’m always looking for new low-carb ideas, so thanks for sharing!